More than 500 people on Saturday attended the official opening of the region’s newest park, Galloway Green. Mums and dads and their children joined in the fun activities after Camden deputy mayor Theresa Fedeli did the honours by cutting the ceremonial ribbon to declare Galloway Green officially open. Galloway Green is the community park at the heart of Mirvac’s new development Crest at Gledswood Hills. 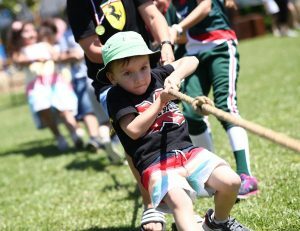 There was an air of high festivity and some serious family rivalry in old-fashioned sports like sack races, egg and spoon races and tug-o-war. 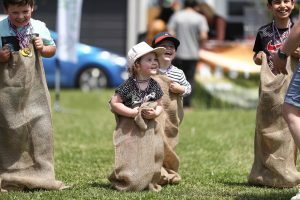 The centre of attention was the farm animal petting zoo, a reminder that all donations from the community fair are going to assist drought affected local farmers. Mirvac general manager of residential NSW Toby Long said the opening of the signified Mirvac’s commitment to creating strong, healthy communities. “Beyond the provision of quality housing and inviting streetscapes we have always concentrated on the things that make a real difference to the way people live,” Mr Long said. Mr Long said Mirvac’s design team gave careful consideration to the lifestyles of future residents at Crest to ensure every resident got the most of out of the wide open spaces within the 90-hectare community. “Close to half of the estate is dedicated to outdoor recreation areas,” he said. There are walking and cycling tracks but the park is the place that really brings the community together. It offers play equipment and a large kick around area and barbecue and picnic facilities. A smart bench with wi-fi and phone charging capability means Galloway Green will be a place for people to connect in more ways than one. 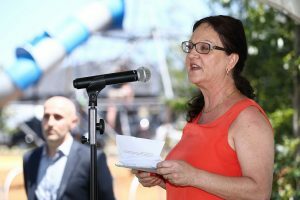 Camden deputy mayor Theresa Fedeli did the honours by cutting the ceremonial ribbon to declare Galloway Green officially open on Saturday.